My name is Ella....and I must confess I love Spam. Last night I had dinner with friends and we all laughed about the food we grew up on, the food that today is not even something we would consider eating, it was hysterical. Well my mum occasionally bought Spam, most of the time she bought fresh salami's as my aunt owned a delicatessen, so we always had fresh salami, but she also bought Spam. I loved it, I still do. One of my boys absolutely loves Spam sandwiches, so when I get it occasionally he has a field day, he loves his spam sandwiches. The great thing about What's Cooking Ella is I get to share food I grew up on. This is a family favourite recipe my mum used to make for parties. After years of not making it, I brought it back at my last party. I love it. It is so easy, can be made in advance, and is perfect with a barbecue or to take on a picnic. The flavours in the salad are really good, everything just works together. So if you love spam, give this a try, it is really good. Adapted from a Margaret Fulton recipe. Cook macaroni according to instructions on the packet. Drain, drizzle with a little extra virgin olive oil so it doesn't stick together once cooked. Cool completely. 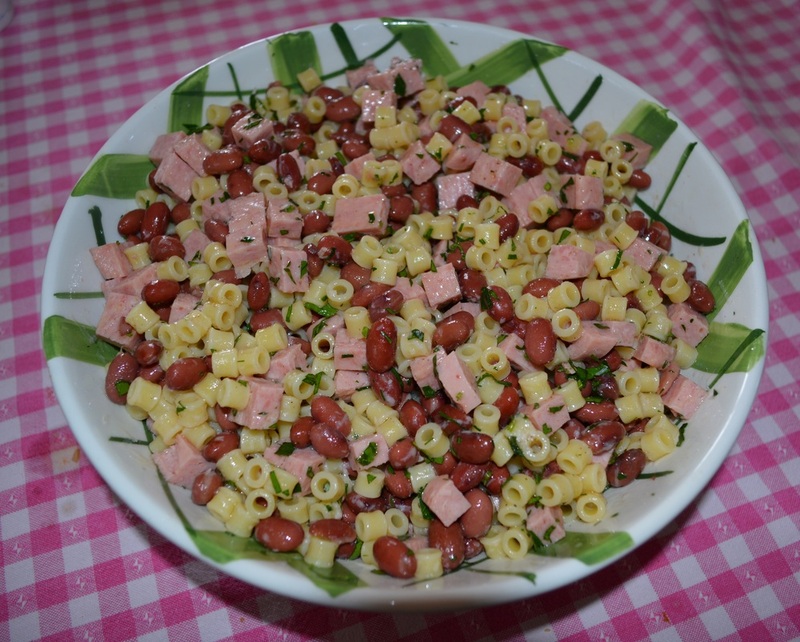 When cold, transfer to a salad bowl, add the beans, spam, parmesan and parsley. Season with salt and pepper. For the dressing start with 2 tablespoons of extra virgin olive oil and 1 tablespoon of vinegar, mix it in well. Taste, if it needs more oil and vinegar add it a tablespoon at a time, until you get the flavour you like.